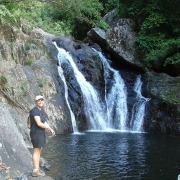 Back Country Bliss Adventures will take you on some of nature's finest bush walks. Stretch those legs a little with a gentle stroll through a beautiful rain forest environment emerging out to see the breathtaking Spring Creek falls or Hidden Valley. Truely amazing! This 3 hour (3km) return walk is great for those adventurous travellers. With no set path you'll need to be steady on your feet as we rock hop along the sides of Spring Creek. There are plenty of opportunities to go for a swim in the many rock pools that are found along the creek. 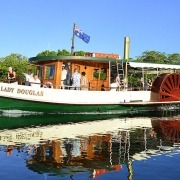 To compliment your stay in Port Douglas we have a wide range of tours on offer so you can really get a feel for this beautiful region. Marvel at the expanse of our ancient tropical rainforests, delight in a kaleidoscope of colour and tropical fish at the Great Barrier Reef, be amazed at a land of contrasts with the outback all within easy reach from your Port Douglas accommodation. 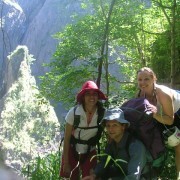 We have family friendly tours, tours for the adventurous, scenic day trips, cultural, educational and romantic. Hardest part is choosing what to do! If you're seeking some adventure, looking for some thrills, perhaps something to get the heart started? 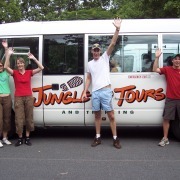 or in need of some exploration, then take a look at our range of adventure tours. 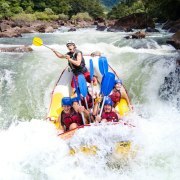 We have everything from white water rafting and Jungle Canopy Surfing to Cooktown Adventures and Hot Air Ballooning. No matter the level of thrill you are seeking, we have adventures to suit everyone! 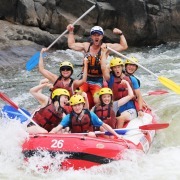 Action, adventure, sports and fun! We love our wildlife and we love our Indigenous culture here in the Far North. So if you're looking to cuddle a koala, pat a wallaby, play a digeredoo or throw a spear then we've got it covered. 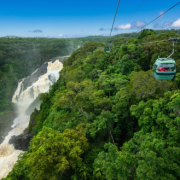 There are also many and varied ways to view the rainforest up close too, with elevated walkways, Army Duck rides, Jungle Surfing on flying fox ziplines, boat cruises and nightwalks, to mention a few. Our attractions are family friendly with most suitable for all ages and abilities. They provide a great introduction to the region especially for those who are short of time, as many combine the complete rainforest, wildlife and cultural experience in one. 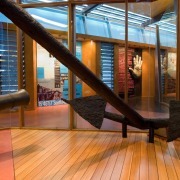 We have World Heritage Listed Rainforest, we have the Great Barrier Reef, we have abundant Wildlife, and we also have Culture...The Far North region is home to a fascinating culture of Aboriginal Australians. For 18 Rainforest Aboriginal tribal groups, the Wet Tropics World Heritage Area has enormous significance as a living cultural landscape. 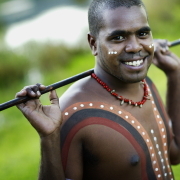 The Kuku Yalanji people are the Indigenous inhabitants of the land that extends from south of Mossman to Cooktown in the north, and Palmer River in the west, they are the Traditional Owners of this area. 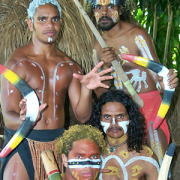 They describe themselves as true rainforest people who live in absolute harmony with their environment. Mossman Gorge and the Daintree Rainforest are at the heart of Kuku Yalanji country, and are home to many of the sacred sites, bush foods and medicines upon which Kuku Yalanji people rely for ceremony and survival. 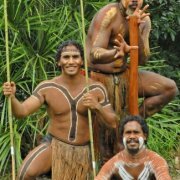 Today, the Indigenous people that live in the rainforest play a very important part in the protection and maintenance of the Daintree. They care for the forest in the traditional ways they always have, and they also continue to pass on their culture and values from generation to generation in the same traditional way. Learn about ‘Bush Tucker’ and the natural medicines that have supported Indigenous cultures for centuries on a Ngadiku Dreamtime Walk, conducted from the Mossman Gorge Centre. These walks take visitors on a journey along private, gentle tracks, visiting special places and culturally significant sites, past traditional bark shelters and over meandering cool rainforest streams. Not only will you be able to experience the beauty of this sacred place, you will also be able to share in the history and understanding of the significance of this natural site with an experienced indigenous guide. Getting there is all part of the adventure. You can either take a fully guided 4WD Safari, or choose to self drive and explore this pretty region at your own leisurely pace. 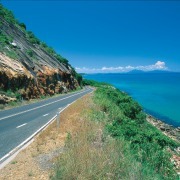 The journey to the Daintree travels along the Cook Highway north of Port Douglas and features beautiful scenery ranging from secluded palm fringed tropical beaches, hidden coves and rugged headlands to the rich green of lush sugar-cane fields and rainforest covered mountains. 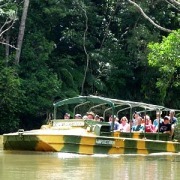 The Daintree River ferry is the gateway to the Daintree Coast and Cape Tribulation, and is the only cable ferry operating within tropical Australia. 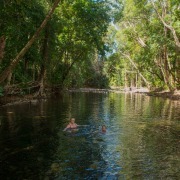 Once over the river there are many natural attractions to visit including rainforest walks, freshwater swimming holes and remote beaches. There are also plenty of adventure activities that take place such as sea kayaking, horse riding, jungle surfing, snorkelling, night walks and more. 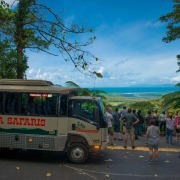 Guided tours depart daily from Port Douglas, and there are plenty of accommodation options should you wish to stay longer and immerse yourself in the rainforest experience. Our consultants would be more than happy to help tailor a unique rainforest package to suit. Dining is an entertaining affair in the Far North. Forget the traditional restaurant set up with square table, simple cutlery and plain cloth, we want to take you on a dining adventure! Enjoy breakfast with some extra special guests at the Wildlife Habitat. 'Breakfast with the Birds' has been a visitor must-do for over two decades. Guests are treated to a fantastic tropical breakfast buffet accompanied by a symphony of sounds and chorus as the friendly birdlife wander freely amongst the tables. Entertaining to say the least! Following this you are freely welcome to explore the variety of habitats within the park and meet some more furry friends. If you're looking for something special then brunch on an exclusive sandy cay island is just that. This once in a lifetime experience will whisk you away to your own private island by helicopter. Enjoy light refreshments & canapes for a romantic memorable experience with your loved one. For a mystical evening of dining in the rainforest, take a look at the Flames of the Forest. Choose from a night of romance and intimacy or an evening of cultural entertainment. Dining is set in a spectacular rainforest clearing, and with the trees beautifully lit up, a magical prescence emits over this unique setting. 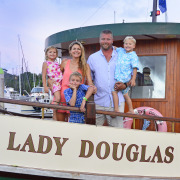 Port Douglas was once a quaint and quiet little fishing village, now it has grown into the sophistication of a world class holiday destination, however fishing is still a favourite pastime, and the industry is alive and thriving with a multitude of commercial fishing charters and professional fishermen. 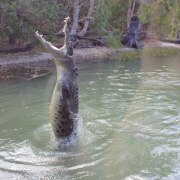 Port Douglas is highly rated as one of Australia's premier sports fishing and game fishing holiday destinations. 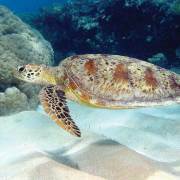 This is due to its proximity to the Great Barrier Reef, Coral Sea and the nearby rivers and estuaries. Both reef and estuary fishing trips are widely available, catering from beginners through to the experienced fishing enthusiasts, and each offering unique fishing experiences. If you prefer a day of action then shark fishing, light tackle fishing, popper fishing or the ultimate in sport fishing - heavy tackle, are options too. The Great Barrier Reef Marine Park stretches from the tip of Cape York in the north to Lady Elliott Island in the south, covering over 348 000 km2. It comprises of over 2,900 individual reefs, 900 islands ranging from small coral cays to large continental islands and 70 different bio-regions. 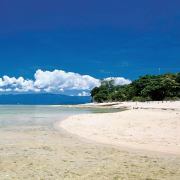 Port Douglas and Cooktown are renowned for crystal clear waters, beautiful coral cays and islands. 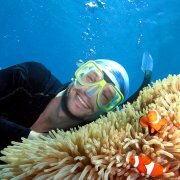 A visit to the Great Barrier Reef is a trip of a lifetime, and we have a whole multitude of activites on offer to view the reef from every different angle possible, whether you're a swimmer or non-swimmer, young or old, flying in for a quick visit or staying longer, romance or adventure, everyone has the opportunity to marvel at the magnificence of the Great Barrier Reef. Choose from full day adventures, cruise and fly options, scenic heli flights, glass bottom boat tours, scuba diving, sea walking, snorkelling, kayaking and the list doesn't end there. Visit an island or elope to your own sandy cay. 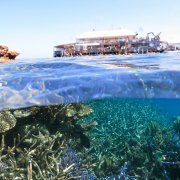 Whether it's above the water or below the water, there are a myriad of ways we can tailor-make your Great Barrier Reef trip of a lifetime to suit. If you're wanting to take it easy, or if you have limted time and are looking at maximising your range of experiences then half day tours are the way to go. There are many activities that can be taken in half a day. Most half day options depart mornings and afternoons, so you can select your touring preferences and even combine them into a full day of activity. Whether you're here for a long time or making a flying visit, looking for some adventure or scenic delights, there is a smorgasbord of half day activities waiting for you. Did you know, the Atherton Tablelands, Queensland, is the most popular place in Australia to float in a hot air balloon? Located west to south-south-west inland from Port Douglas, the Atherton Tablelands elevated position provides ideal weather and climate conditions for this gentle activity. With 98% tour reliability, this statistic is unmatched anywhere else in the world within the Ballooning industry. Sunrise provides the perfect conditions for taking a hot air balloon flight and to witness the most beautiful coloured landscapes. 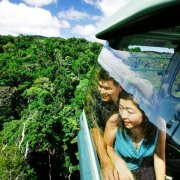 Experience panoramic views of the rainforest mountains, rolling hills, fertile soils and bushland. If you're lucky enough you may get to see a kangaroo or two. The spectacular balloon inflation display is all part of the excitement and build up. 30 minute and 60 minute hot air balloon flights operate daily year-round, with return coach transfers available from Port Douglas, or you can choose the option to self drive and then enjoy the rest of your day exploring the Tablelands and surrounds. 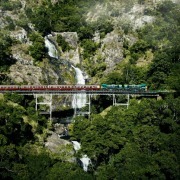 The Kuranda Train & Skyrail is one of the most sought after trips in Far North Queensland. The journey to and from Kuranda Village offers two very different experiences combining, history, heritage, rainforest and environment. 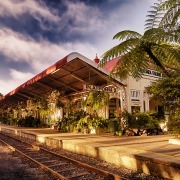 Kuranda Village has been operating as a tourist destination since the 1970's with the famous Kuranda Markets being the drawcard, and which are still drawing visitors today. 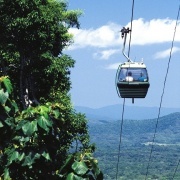 The first operation of the Kuranda Train commenced in 1936 and the Skyrail Cableway, a world first for viewing the rainforest in a safe and environmentally way, commenced operation in 1995. 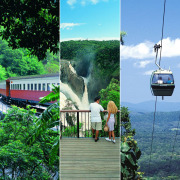 Time spent in Kuranda Village will allow you to explore the variety of market stalls inside the Original Markets and Heritage Markets, take a rainforest walk or enter the various wildlife attractions within the village. 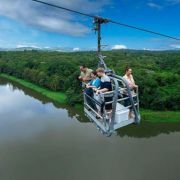 There are also options to add on various elements to your day including Tjapukai Aboriginal Cultural Park, Rainforestation, Birdworld, Australian Butterfly Sanctuary, Kuranda Koala Gardens or Hartleys Croc Park. Whichever you choose, we can help tailor a Kuranda package to suit. As we are a destination renowned for World Heritage Listed Rainforest, no journey to Cairns would be complete without a rainforest experience. Travelling north up the scenic Cook Highway is the Daintree National Park which comprises of two sections - Mossman Gorge and Cape Tribulation, covering an expanse of more than 1,200 sq km. Mossman Gorge is renowned for its crystal-clear waters that cascade over granite boulders, Indigenous culture and spectacular rainforest walks. 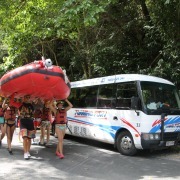 Most tour itineraries include a visit to Mossman Gorge. 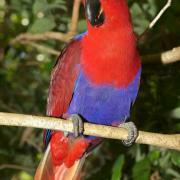 Beyond Mossman is the Daintree River, famous for its boat cruises, croc spotting and bird watching. Once across the Daintree River the Cape Tribulation section of Daintree National Park then stretches from Cow Bay to the Bloomfield River, covering 17,000 ha of coastal range. Cape Trib beach is fringed with the increasingly rare littoral (beachside) rainforest and interesting fringing reefs, and is renowned as the place where where two spectacular World Heritage sites meet - the Daintree Rainforest and the Great Barrier Reef. This area of rainforest is a hive of activity from bush walking, kayaking and horse riding treks to snorkelling, exotic fruit tastings and 4WD safaris. Accommodation is readily available, and it is highly recommend to spend at least one night in the rainforest to experience the closeness of nature and the wonders of this ancient land. Enjoy some simple pleasures and take in the scenic sights around the region. From the rainforest to outback and reef, our region is a treasure chest full of gems to discover. Whether its on land, in the air or on water; there are plenty of options to really engage and marvel at the beauty of Tropical North Queensland. Port Douglas is a spectacular one hour drive north of Cairns along one of the most scenic coastal roads in Australia, featuring amazing views of rainforest covered mountains on one side, and the Coral Sea on the other. Rex Lookout is one of many highlights along the way with views along the ranges back towards Cairns. Hiring a car gives you the freedom to explore the region at your own pace and go wherever your heart desires. You can visit all the best attractions at your own leisurely pace, or explore further afield in our surrounding regional areas such as the Atherton Tablelands, Daintree & Cooktown. 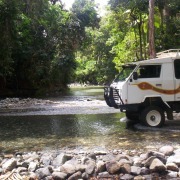 Most roads are sealed, so unless you are planning to go to Cooktown via the Bloomfield Track, you will not need a 4WD. If hiring a car it is possible to make your own way to our various attractions around the region. 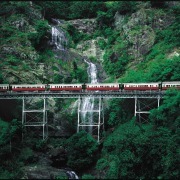 Kuranda is approx a 1 hour drive south from Port Douglas, and up the Kuranda Range, however if you don't want to miss out on the Train & Skyrail experience then we can organise a bus transfer to return you to your vehicle at the end of the day, as the Skyrail Terminal and Kuranda Train Station are in two seperate locations. Wildlife Habitat at Port Douglas makes for a lovely half day out for the family, especially if you add on the Breakfast with the Birds. Afterwards wander off breakfast around the park, then perhaps enjoy an afternoon of shopping along Macrossan Street. A visit to Mossman Gorge is a must, and the kids will love Hartleys Crocodile Adventures located just 25 minutes from Port Douglas on the Cook Highway. You can arrive at anytime of the day to the wildlife parks, national parks and Tjapukai with activities and action taking place all day long. Our tropical climate lends itself as a fantastic destination for scuba diving year round, with excellent visability usually between 15-20 metres and water temperatures ranging from 24C to 30C. 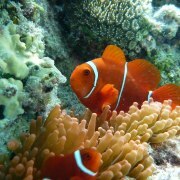 There are a number of reef cruises departing from Port Douglas daily that specialise in scuba diving. The advantage of choosing a fast catamaran trip is that you can travel further and faster, so your day is maximised with the best reef experience, and more time to enjoy in water activities. 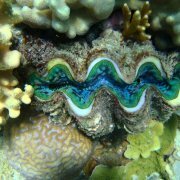 The Agincourt Reef system is one of the best known of all the reefs accessible from Port Douglas, comprising of four separate reefs commonly referred to as the ribbon reefs. Clear oceanic waters flush through these reefs creating the most spectacular coral gardens and attracting a huge variety of marine life. Most reef operators have roaming permits which allow them to visit anywhere up to 45 different reef sites at 16 different reef locations. 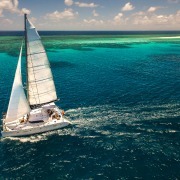 This allows the operators to choose from a wide selection of reef sites best suited to the conditions of the day. All water activities are conducted from the vessel, and all scuba diving is guided by qualified Dive Masters/Instructors in small groups. Tour combos are extremely popular as they include the very best experiences of the region already selected and packaged to go. They can be flexible around your holiday timeframe and most importantly - they offer great savings too! Reef and rainforest combos combine the two main highlights of our region - the World Heritage Listed Great Barrier Reef & Daintree Rainforest.